Expressions of Interior California Newspapers. Marysville Appeal: The Board of Supervisors of Butte County have passed an ordinance giving citizens power to establish walks for pedestrians and bicycle paths along any public road in the county that is one hundred feet in width, says the Chico “Enterprise.” The paths, when established, must not be over twenty feet wide, and it is left to the Road Commissioner of the district in which the path is to be established to designate where the path shall be built. 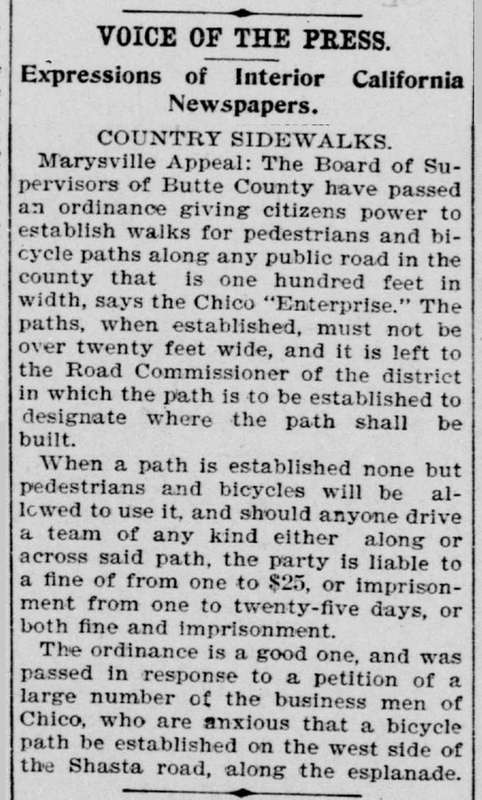 When a path is established none but pedestrians and bicycles will be allowed to use it, and should anyone drive a team of any kind either along or across said path, the party is liable to a fine of from one to $25, or imprisonment from one to twenty-five days, or both fine and imprisonment.